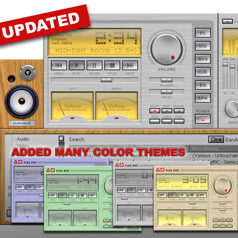 After a week of hard work i release the new version of AS Fx21 player. Many bugs removed, components are now separated, added bass, treble and gain knob controls, added some extra components like speakers and clock, improved graphics and maki code. I enjoyed the first one and played around with it a little http://home.halden.net/yrgal/files/as_y.jpg This one is quite good too, but I don't think the blue is right. REALLY KEWL SKIN!!! I love the speakers and the extra vol. meter. 5 out of 5 stars from me Way to go and I look forward to seeing more (I hope hehe)! Brilliant skin-I liked the last one also.The VU meters can do with backlight illumination like the one in previous skin. This is awesome. I've never had another Winamp skin quite like it. I love it. Winamp is it complet now! LOL Well You have tickeled my fancy HAHA....I love it !~!....and the Speakers I dont download many winamp blinds....and I wont download anymore unless your name is on them......THIS IS SO TOTALLY AWESOME>>>>>>>THANK YOU !~! I went back to winamp to use this skin... need I say more? I'm in love with this skin! This is outstanding work! Thank you for soo much for creating and sharing!! very nice, thanks for the hard work! THIS IS THE BEST,THE TOP OF ALL SKIN!